Providing tractor-drawn wagon or trolley rides to the public requires a unique liability for your business. Very few insurance companies have a policy that will protect this type of activity. Fortunately, we offer a variety of liability policies including equine and livestock insurance. It is vital that you understand your insurance coverage because you need to know what is covered and what is not. You should be aware that Homeowner’s Policies do not include commercial ventures, so if you are getting paid for your tractor ride services, you would not be insured under that policy. Farm Owners Policies may insure liability for the use of a tractor and wagon, but not if you are receiving compensation for the service. Some farm insurance companies may be willing to insure a few rides that are given at your premises, but not if of a more commercial nature and off-premises. Check with your farm insurance company to be certain you understand your coverage limitations. Tractor Drawn Rides may be done on public country roads, field roads, at festival and fairground facilities, or on city streets or corporate parking lots. Wagon and People Mover Trolley Vehicles have the capacity to carry up to 14 people, some less and some more, and are pulled by an Ag tractor operated by an experienced driver. The purpose of the ride is primarily recreational with hay rides as an example, but maybe for the purpose of property touring or transport of passengers from one location to another. Operators may contract with a fair, festival, city or park, resort or other business to provide rides. But they may provide rides only at or adjacent to their farm premises. The high season for rides is in fall when operated to coincide with farm, orchard and vineyard harvests, and the Halloween, Thanksgiving and Pre-Christmas holidays. Operators may be paid by the hour, day, or by the ride or passenger. Because of the potential for several people to be injured at one time, risk reduction standards are strict though reasonable under Ark Agency’s program. Underwriters will evaluate vehicle condition, age, and design. Seating must be fixed for security. Even hay bale seating must be rigid and secure. Vehicles must have fixed side panels so people cannot easily fall or jump off. Tractor condition is another concern. Brake systems must be checked and fully functional. Tractors should be on a regular maintenance schedule. Vehicles must have slow-moving vehicle sign display and lights if used on public roadways. Also considered is driver age, training and experience, not just with tractor driving, but also in working with the general public. Other points of review: The safety of routes on public streets; Passenger control and monitoring procedures; Alcoholic beverages may not be consumed on rides; Obviously intoxicated people may not be allowed on board. As a tractor-drawn ride operator, you worry that you may be sued or otherwise have a claim made against you for bodily injury or property damage by a customer, guest, or someone else who comes in contact with you or your property. If sued, you will need to hire a lawyer to defend you and you wonder how you would go about doing this. If found negligent or responsible, you would likely have to pay a court-ordered or agreed-upon settlement to the injured party. Fortunately, much concern can be relieved when you buy a Commercial General Liability Policy [GL] to insure your Tractor Drawn Rides. When you have Commercial General Liability Insurance, you are protected from financial loss if a visitor, customer, or trespasser is injured or their property is damaged due to your operation. If well managed, the tractor-drawn ride risk ranks moderate to moderately high. Premium rates reflect the level of exposure. The greatest concern is the potential for several people to be injured in a collision or the overturn of a wagon or trolley. Another risk concern is that rides are often given in high traffic areas and/or on public streets where pedestrians of all ages or other vehicles may come in contact with or affect the management of a ride. The risk is moderated by sound management, design suitability and maintenance of vehicles and tractors, and the adherence to common sense risk reduction practices. A passenger is injured when falling from or jumping off a wagon or trolley. Alcohol use is sometimes a factor. 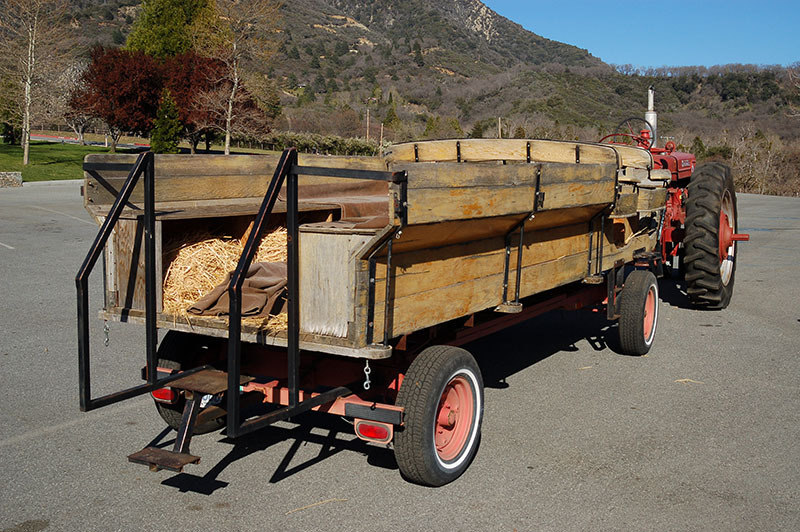 The tractor or wagon sideswipes or collides with an auto or other object, causing property damage and perhaps bodily injury as well to passengers on the wagon and in the auto. There is a malfunction of tractor steering, brakes, or the tractor or wagon hitch, causing an uncontrollable situation to occur. Multiple serious injuries are possible. A child or adult is allowed to sit and ride on the fender of the tractor and falls off when the tractor stops or starts. Determine the right insurance coverage for your specific business when you turn to Ark Agency for horse insurance, ranch insurance, or other liabilities. We make it simple for you to communicate with us because you can call our team at 1-800-328-8894 or send us an email.